The Legend of Zelda: Breath of the Wild is my best game released in 2017. It takes the concepts that worked in all previous Legend of Zelda games and transforms them. Meaning that storytelling, graphical style, exploration, puzzling, some minor role-playing elements are re-energising them again. Breath of the Wild also takes the elements of the best role-playing games (RPGs) and transforms them. Providing a large-scale world in which the elements interact with the player. Therefore creating unique exploration and combat challenges. The advantage of Breath of the Wild over other Nintendo Switch games, is that it can also be played on the Wii U. This naturally means anyone with Nintendo’s last generation console does not have to miss out. However, this game is perfect for the Switch’s mobility. It feels easy to use in handheld mode and can survive for around four hours on plane, bus or car trips. The world of Hyrule is a massive undertaking in exploration. This is made easier by the use of in-game teleportation, flight and animal transport. Much time, therefore, is spent in the game roaming around looking for gear, quests, shrines and towers. All of these are linked to a piece of technology called the sheikah slate. Most of the other time is spent scaling cliffs, solving quests, collecting food, and cooking. There are multiple enemies within the world of Hyrule. From the classic Moblins and Bokoblins, to the new Guardians. The new Guardians are terrifying in the way that they hunt Link across the world. They possess a lock-on eye-beam blast that can instantly remove most of Link’s health. There are also Wizzrobes, Hinox, Talus, and Lynel to look forward to in your adventures across this world. With each monster requiring different methods to defeat them. Further, these monsters also releases unique items when defeated, making it worthwhile to tackle them (either by sneaky means or head-on!). The actions of combat and movement are straightforward. Unlike in previous Zelda games, Link can not only run and walk, but jump and climb. Climbing, however requires the stamina bar (as does gliding). Which means that to traverse long distances, players must be strategic in their actions. Most combat involves simple thrusts and slashes. 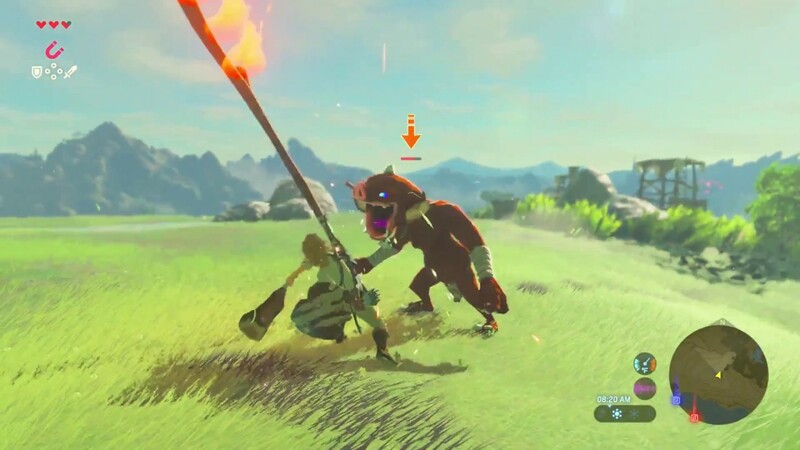 However, Link can block and parry attacks in combat. He can also perform more complicated jump and charge attacks to deal additional damage. Link also has the benefit of being able to throw any weapon at enemies, and the use of his bow (and a range of special arrows) for ranged attacks. Be warned: every use of a weapon, shield or bow will weaken it. This depends on the enemy or object they strike, but eventually it will shatter. Meaning that a strategy for how weapons (and items) are used becomes crucial. However the challenge of combat is only one of the many frustrating and rewarding elements of Breath of the Wild. The elements themselves are against Link. When rain is occurring in-game it becomes difficult to climb rocks. Thunderstorms mean trouble, particularly if Link has equipped metal, as bolts of lightning will zero in on his location. Icy locations require Link to be equipped with a fire torch and warm clothing or heating potions. Fire locations require Link to be equipped with heat proof potions or flame proof clothing. The way in which this game has been so carefully thought out is fantastic. Every mechanic balancing against another in a organised system. Cooking is another element of Breath of the Wild. As the food you cook can provide special elixirs, potions and food types with special enhancements. On top of this, every shrine challenge allows Link to progress towards gaining additional stamina or health. Horses can be mounted and saved as steeds at stables. And then these stables can also be used as places in which to rest and recover health. Sleeping in beds may cost a few rupees, yet the bonuses this provides can be worthwhile as well. Cooking plays a role in Breath of the Wild. Even if some food is…dubious. In essence, this is a game with numerous numbers of possibilities. Want to explore some beautiful scenery? How about you cook up some unique combinations of food? Or climb mountains, or ride horses, or fly? You like collecting vast fortunes and leveling-up the abilities of your gear? This game has that and more. The plot itself follows Link as he awakes in Hyrule long after some mysterious event. This has left the world shaken and desolate. He only has his clothes and the shiekah slate, meaning that the first few hours of the game are spent running around. All while unlocking the slate’s abilities and earning the ability to glide out of the first level. From the beginning Calamity Ganon (this Zelda’s version of Ganon/Ganondorf) is visible in the middle of the world at Castle Hyrule. Players could head straight to Ganon without completing any other story elements. However, doing so would lead to an inevitable loss. Unlike other The Legend of Zelda games, dungeons exist in a different form. This is in the form of Divine Beast challenges. 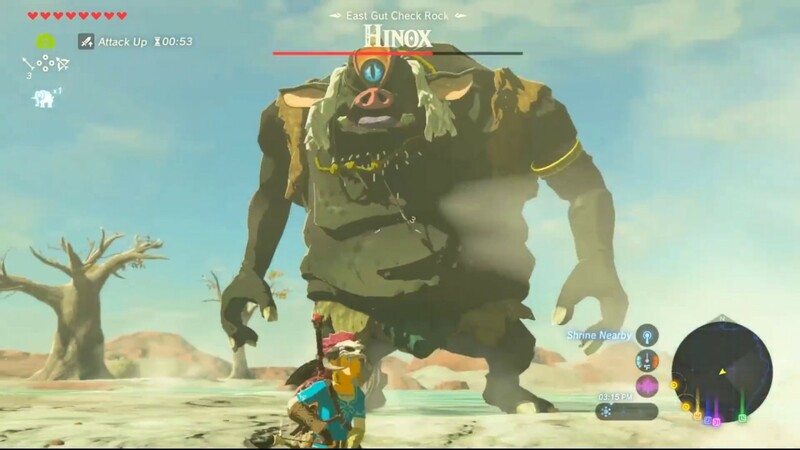 These are incredibly huge animal-form machines that have the power to help defeat Ganon. However, unfortunately have been taken over by Ganon’s dark magic. Part of the story of Breath of the Wild involves travelling to and reclaiming each of these Divine Beasts. All before making a final assault on Ganon. During these quests, players can unlock various upgrades for Link and the runes his shiekah slate allow him to access. These runes allow Link to stop the time of an object, freeze blocks of water, and throw various bombs. Not too dissimilar to the items dungeons would earn in previous The Legend of Zelda games. Currently I am over 30 hours into the game without nearing completion. This is a long game, which immerses the player in its world. And once the player has finished the main story there is plenty of planned DLC (downloadable content). In order to provide additional quests, missions, and gear. Players can also purchase a variety of Zelda specific amiibo. Each of which unlock particular classic Zelda items for use in the game. In many ways Breath of the Wi is one of the greatest games Nintendo has ever created. It is a true console-selling game. It may not be the greatest RPG ever made, nor the most influential game in the Legend of Zelda series. Yet the way in which it takes the elements of the past, and melds them into the gameplay of the future is incredible. All while creating a living and breathing world with environmental and physics-based rules. My verdict: a genre and console defining must-play! ⟵Splatoon 2 – Inkresistable or a Mess?